Financial planner Bill Del-Sette had two separate websites. One was used for the business as a brochure style website, explaining the basics of the business. The second website was devoted to Bill’s blog. Bill has decided that the message of the blog, happiness in retirement, was the message he wanted to deploy generally. We needed to combine the two existing websites into one, creating a new look while ensuring that old branding was not completely lost. 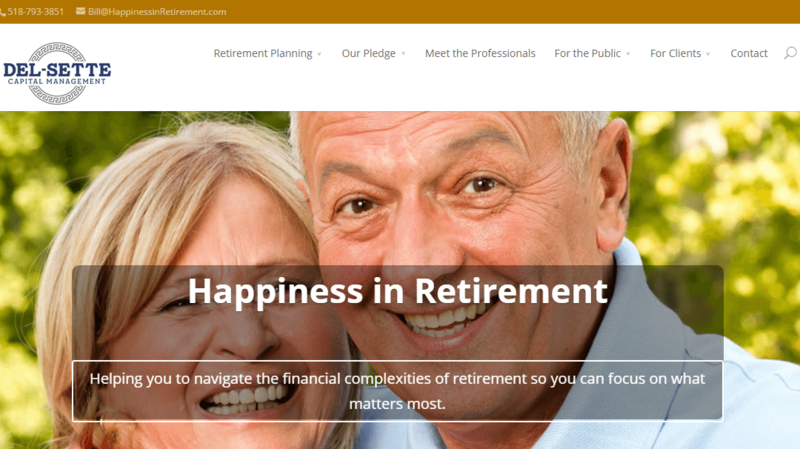 The Happiness in Retirement blog was a WordPress website developed by someone else. We used the WordPress framework as the basis for the new site. All content from the other (non-WordPress) site was brought in to the WordPress framework. When this type of migration occurs, we need to be aware of what are called redirections. Visitors to the old site need to be taken automatically, seamlessly, and invisibly to the new site. If redirections are not in place, visitors will reach a “page not found” error. This is bad for visitors of course, but ultimately search engines will start to punish the website if these errors go uncorrected. Unfortunately, we have ended up helping many clients whose prior developers were not aware of this basic step. We deployed a brand-new theme for Bill’s website. His previous theme was not responsive, meaning it was not ready for mobile devices. The new theme, built by ElegantThemes, is designed to respond to screens of all sizes. Regardless of what device you might be using to visit the website, the site should be legible and attractive. We made use of a social sharing plug-in, or software module, from the same developers, to enable visitors to the site to readily share Bill’s blog posts via such social media outlets as Facebook, Twitter, Google plus, and LinkedIn. We helped Bill to integrate a Google calendar on his website as well as scheduling software from a third party provider. Bill distributes a free e-book, and we set up his request form to reduce the likelihood of spam requests. An avid photographer, Bill’s Flickr account is also incorporated into the blog. The new website coincided with an office move. Bill and his team are now located on historic Union Avenue in Schenectady. If you decide to visit, please tell him that the goat sent you!